Bitter melons are quite popular in different parts of the world. Various cultures make it in different and unique ways. One of the most popular ways to make bitter melons is stuffing them with different types of filling. If you're diabetic, this amazing vegetable can help you in maintaining your blood sugar level quite effectively. Today, we are going to cook a variant of stuffed bitter melon recipe. I've added raw mango and mint in this preparation to give it a tangy flavor. Mint leaves not only add flavor to the preparation but also makes it easy to digest. By adding some vinegar, you can keep these stuffed bitter melons for a long time. Let's make this stuffed bitter melon recipe in a few simple steps. 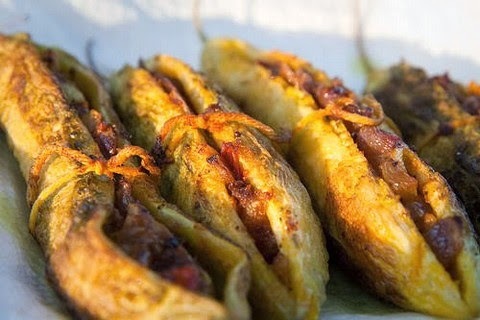 Relish these tangy and mint flavored bitter melons which are stuffed with select herbs and are cooked to perfection to give you a perfect flavor and texture. 1. Scrape the outer skin of bitter melons. Make a cut in between and remove all the pulp from inside. 3. Finely chop the onions. 4. Peel the raw mango and make its paste in the grinder. 5. Coarsely grind black cumin and fennel seeds. 6. Remove seeds from the bitter melon pulp and mix coarsely grounded powder prepared in the previous step. 7. Make a fine paste of mint leaves. 8. Heat 3 tbsp oil in a shallow frying pan. 10. Add the bitter melon pulp along with red chili and turmeric powder. 11. Fry for 2 minutes and add mango and mint paste. 12. Add little salt and fry for 3 more minutes. 13. Fill this pulp in bitter melons. 14. Take 1 tbsp oil in pan and simmer all stuffed bitter melons on low flame till they turn light brown. 15. Garnish with coriander leaves and ginger julienne.